Standing on the top deck as we approach Plymouth. The Eddystone lighthouse off the entrance is growing larger, four naval ships are steaming out of Plymouth sound, we can see a few fishing boats and a couple of yachts. Owners are collecting their dogs from the kennels, some are frisky, some decidedly wobbly depending on the state of their sea-legs. 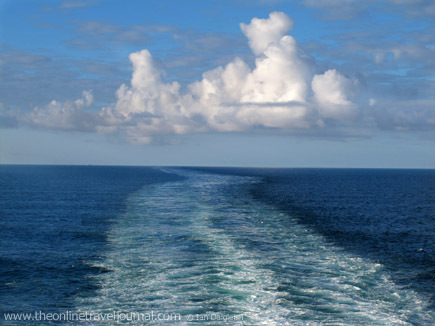 All round traveling with Brittany Ferries has been very enjoyable – almost over too soon. I think you could say I have become a fan.